Yesterday was the last day of my long commute from Sunnyvale to the city… at least for a while. On a good day, it would take an hour in the morning, and 90 minutes on the way home. On a bad day, it could take more than 2 hours each way. But most days, I tried not to think about it or I’d get depressed. 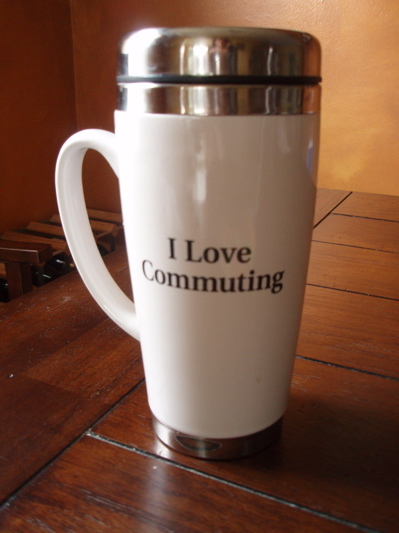 After a particularly bad commute day (like when someone decided to park their car on the tracks or my Muni bus ride got stuck in Giants traffic causing me to miss my bullet train), I bought this mug in an effort to bring some humor to the daily grind and hopefully cheer up some of my train-riding companions in the process. Most people got the joke, but I’m sure there were a few who just thought I was plain crazy. Sure, it was nice to have all that reading and editing time or space out time to transition from work to home and not have to fight traffic in my car, but a long commute is a long commute no matter how you slice it. Carl never quite understood why I dreaded it so much until recently, when he had a conference in the city and decided to join me on my daily train and Muni bus ride. I was secretly hoping something would go wrong so he’d see why I sometimes came home in a foul mood. I know that was wrong, but it actually happened. Our Muni bus got stuck in traffic, and we missed the bullet train and almost the train after which was 30 minutes later. We ended up getting off the bus and running in the rain to catch the train. He finally understood why I was so exhausted every evening when I came home. Commuting is full of anxiety – if you don’t leave the office exactly at 5:05pm, you don’t get to the bus stop in time and you miss the train, and all is lost. 1. I fell asleep on my way home on the train, and woke up just as the train was pulling out of the Sunnyvale station, expressing south to San Jose. This was a day when Carl was picking me up from the train station so we could zip over to our couples group. As I woke up and realized what happened, I looked out the window and waved, saying, “bye Sunnyvale” and made the humiliating call to Carl that I missed the exit and was heading 25 minutes south. Oops. 2. After racing to the train for my commute home, I received the depressing news that there had just been an accident on the tracks. This could mean a 4-hour delay. So myself and 5 others decided to take the matter into our own hands and share a cab back to Sunnyvale. During rush hour, this is about an hour drive. The funny part is that my new Indian friend who coordinated the taxi ride assembled a group of all Indian people and me. I wondered how I made the cut and if she new the other guys sharing our cab. She said, “No. But since they were Indian, I figured they all lived in Sunnyvale.” She was right…. and she has been my saving grace on many commutes home, even giving me a ride to my house during the uncomfortable last month. 3. I got to know another Muni driver who became my buddy. Jose used to be one of my Muni drivers when I lived in the city, so we recognized each other right away. We shared stories about our pets and families, and then he got moved to a different route. I recently ran into Jose when we were both passengers on a Muni light-rail going through the city towards Union Square. He lit up, took my hand and kissed it, and was so pleased to see me again. I told him I was pregnant and he said, “It’s about time.” I just laughed. Now, as I await the arrival of Baby H, my biggest commute is to the couch to rest and possibly read a parenting book. I plan to retire the mug for a while. While I’m editing at work, I often have one of my Pandora stations running in the background. A song kept coming up in rotation on my Swell Season station (another amazing band). It would stop me in my editing every time and I’d click on my Pandora to see who was singing. Sara Bareilles. Her song “Gravity” showcases her amazing talent – gifted songwriter, pianist, and voice that clearly transports me from my clicking away at my computer keyboard. Don’t let Carl’s orange tie fool you. This past weekend we went to a black tie optional wedding at the Fairmont Hotel in the city. 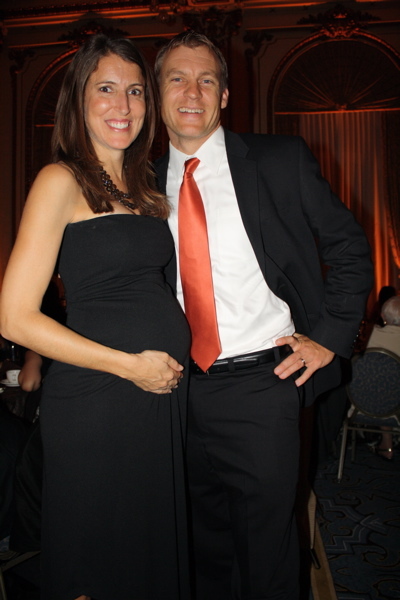 Thankfully, a friend loaned me a stretchie black dress to fit the bump. And folks, I think we have a dancer. Ever since dancing the night away at the reception, the bambino has not stopped dancing inside of me. I know this should be a beautiful thing, but it still kind of freaks me out in a sci-fi sort of way. Am I alone in this? I even had a strange Poltergeist dream the other night. Help. I guess it’s becoming quite clear to the world that I’m pregnant. No longer are people staring at my bump and wondering if I’ve developed a beer gut or if I’m expecting. I’m clearly pregnant. When I boarded the Muni bus to the CalTrain station on my commute home, there were no seats available. An old woman looked at me and said, “Do you want to sit down?” Wow. That’s a first. (Loving the prego perk.) I told her I was fine. “No, really, do you want to sit down?” she insisted. I complied and as soon as I walked over, an older business man sitting next to her shot out of his seat so I could take his. 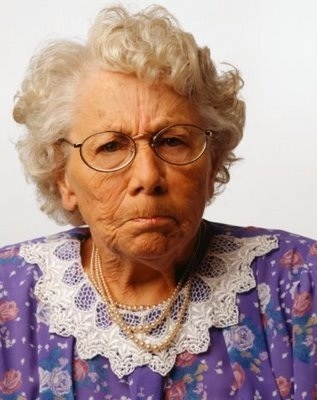 The old lady looked me up and down, proceeding to tell me about the 23 grueling hours of labor she went through when she gave birth to her daughter some 50 years prior. She said it was so terrible, that she vowed never to go through with it again. Wow. Thanks for the unsolicited not-so-helpful story. I was warned that events like this would happen, so I was prepared to take her story and let it go in one ear and out the other. Fortunately I was spared from her rubbing my belly too. But I’m sure that day will come. My friends keep reminding me that I’m not going to be able to keep the name of this blog for long if I don’t start posting some things about the city. Even though I now live in the “burbs” I do still spend most of my waking time in the city each day and have had countless city experiences to blog about. But alas, I have not made time. Here’s to more city posts! I do still ride the Muni bus every day, and while I practice my Mandarin and Spanish (as I’ve almost memorized the recorded messages that repeat on a never-ending cycle), most of the time my Muni rides are pretty uneventful. Except for last Tuesday. 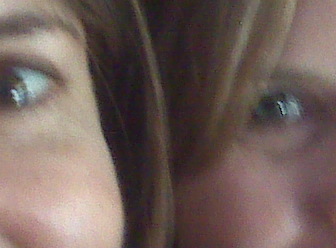 My friend Kate and I boarded an express Muni bus during rush hour for our commute to small group in south San Francisco. The bus was beyond packed. The kind of packed where you don’t know who is touching or bumping into you. While standing, we held on to the metal bars above our heads and planted our feet firmly in a surfer’s stance for balance. We cruised passed Union Square and the city streets, and soon made our way to the 101 on-ramp. Hold on a minute. We’re going to stand up while riding on the freeway? No comments about seat-belt laws here, but truly, I felt like we were in a scene from Speed. I had never seen the freeway from this vantage point before, and let’s just say, I was kind of excited. (I think it’s been too long since I’ve been on a roller coaster. Thrills come really easy for me.) So, while holding on with one hand, I decided to snap a picture of Kate and I on this crazy adventure. And this is how the picture turned out. Now you don’t believe my story anymore, do you? Oh well. The Summer has now begun in San Francisco. I survived another cold and foggy June – August, and I’ve finally put my scarf and beanie away and dusted off the flip-flops. I had to take this picture of a sunset in San Francisco, to prove that the sun does shine in the city. Carl is always surprised by this fact, but it’s true. It’s no Sunnyvale, but when the sun chooses to shine up here, it’s glorious. I actually took this picture on my way to Trader Joe’s the other night. I’ll miss this view from my house! For those of you who don’t know, I work really close to the the Trans-America Building – the skinny, pyramid-shaped building in the background. It’s true. I “heart” SF. Who says you can’t have a garden in the city? Thanks to our upstairs neighbor (who created two great planter boxes), Wendy and I are now farmers. We’re growing zucchini, tomatoes, and pumpkins…. and possibly one red pepper plant (still not sure if it will make it). This whole gardening thing was kind of an experiment, evidenced by the pumpkin plants that are taking over our yard. I guess the seed packet was right when it said to plant the pumpkins on a hillside, 8 feet apart (not 3 inches apart in a 6-foot planter box). Oops. Here we are at the farmers market at the Ferry Building on Saturday. No plans to start selling our produce just yet, but I can say we have a greater appreciation for all things home-grown.